No one turns down a chance to host Elan Sassoon, son of hair magnate Vidal Sassoon, when he calls a prominent salon to release his new brand Sojourn - unless you are Rabbine Harpell, owner of Azura Salon in Bend, Oregon. She said â€œgive me a few days to think about it..â€� When she returned Elan's call 2 days later, Rabbine was beyond excited and realized this was a ï¬�rst for her and a ï¬�rst for Elan as he traversed the Paciï¬�c Northwest. She has been in love with Sojourn since the very start in 2010 - so much so that Elan refers to Azura as the â€œA Teamâ€�. When they say â€˜give us two weeks and we will change your hairâ€™, it's a true statement. There is not another line that has so much positive chemistry!" " The Salon Locator has also been an asset to Rabbines' salon; living in a destination resort area like Bend and carrying an international line like Sojourn. Sojourn now enjoys this international status thanks to a partnership with Matthew and Debbie Boulton. In addition to the US, Sojourn International is also in the Canada, UK, Poland, Spain, and Australia. Sojourn International is known for it zero sulphates, gluten, parabens, formaldehyde, salt, alcohol, or artiï¬�cial color and is 100% biodegradable. " 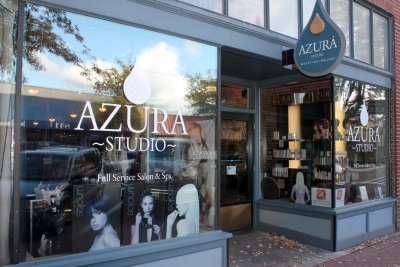 Azura has over 25 stylists; so next time you are visiting Bend, please stop in and visit with Rabbine at 8556 NW Bond Street.